Welcome to the latest issue of our weekly newsletter bringing you all the goings on at Cheshire's friendliest Golf Club! - The good scores continue in our Winter League. 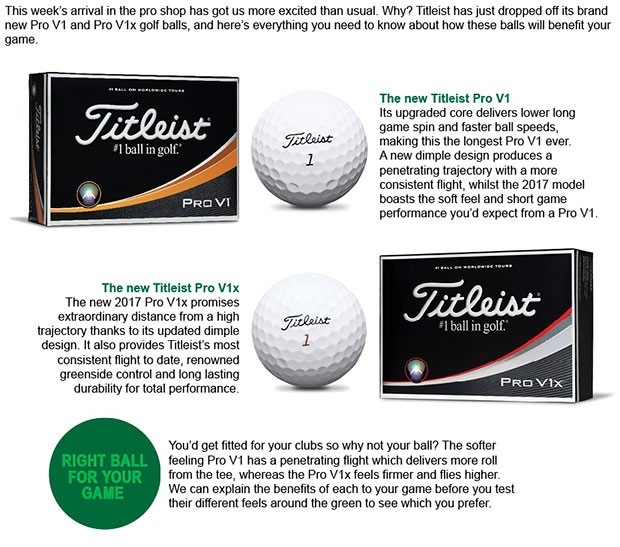 - Answer our question to win a sleeve of the new Titleist ProV1's. - Noel's easy way to an extra 20 yards. The sixth round of the Winter League was played on Saturday and there was a big move made by Steve Nicholson and Steve Bond, they dove tailed perfectly to score 25 points including birdies on holes six and eight to take top spot for the second round running. In second place were the consistent pair of Stuart Gray and Jonno Ness who scored 24 points including a valuable four point birdie on the last hole this saw them take second position just in front of Rick Smith and Steve Hulse who also scored 24 points on another day of good scoring. 1. Stuart Gray and Jonno Ness - 118 points. 2. Steve Nicholson and Steve Bond - 117 points. 3. Tim Barnes and Chris Whalley - 113 points. 4. Julie Daines and James Eaton - 112 points. There are another five pairs within four points of the fourth place qualifying spot so there is still a lot to play for, the next round is on Sunday, 12 February. Stuart Gray and Jonno Ness above. It was a busy end to last week as we had lots of new stock arriving, as well as the new Callaway Epic range and the new TaylorMade M series clubs turning up we also received delivery of the new 2017 Titleist Pro V1 balls - it is still the industry leading ball used by most professionals and good amateur golfers and for good reason - it works! A fun quiz question before we tell you why the 2017 Pro V1 ball is so good - the prize is a sleeve of the new Titleist Pro V1 balls and all you have to do is be the first person to answer our question. The question is - what is the name 'Pro V1' short for? The first right answer we receive will win a sleeve of the new balls, and if you don't Google the answer that will be even more impressive! Click here to let us know your guess now! Before the first Pro V1 balls came along in 2001 a golfer had a difficult choice - to use a hard feeling ball and get more distance off the tee or to sacrifice distance and use a softer feeling ball, either way there was always a trade-off, when the Pro V1 ball came along with its revolutionary urethane cover it changed everything. Suddenly the new ball offered the best of both worlds - incredible distance off the tee but also an unrivalled soft feel and control on short game shots around the green, as soon as it was launched nearly 100 Tour players switched immediately to the new ball and many have not changed since! Average golfers think they're not good enough to use a Pro V1 ball, but the truth is that the Pro V1 ball is the best ball for EVERY golfer. If you like a slightly harder feeling ball then the Pro V1x is the ball for you, if you haven't tried a Pro V1 ball you don't know what you're missing out on and the new version with its improved core is better than ever as it's softer and more durable, but offers a penetrating flight but lower spin on tee shots which is the key to more distance. Have a look at this video here and you can see why the 2017 Pro V1 ball is better than ever. We see many golfers in our fitting studio every week and we've had a lot of success stories, but one of the easiest ways to an extra 20 yards was achieved by Noel Barlow. Noel is a good player, but as a more mature golfer his clubhead speed was slowing and distance was dropping off - he had a pretty decent PING Anser driver that was probably around four to five years old, but straight away we knew that a bit more loft and a lighter shaft would make a world of difference to Noel. We put the new 12 degree 2017 TaylorMade M2 in his hands and using the exact same swing Noel picked up speed and launch with the lighter club and was bombing the ball an extra 20 yards off the tee within minutes! He was so impressed he was soon trying out the matching high launch M2 3-wood and hybrids and hitting them further than ever, in the end we transformed Noel's long game in less than 30 minutes and he is ready for the start of the season! 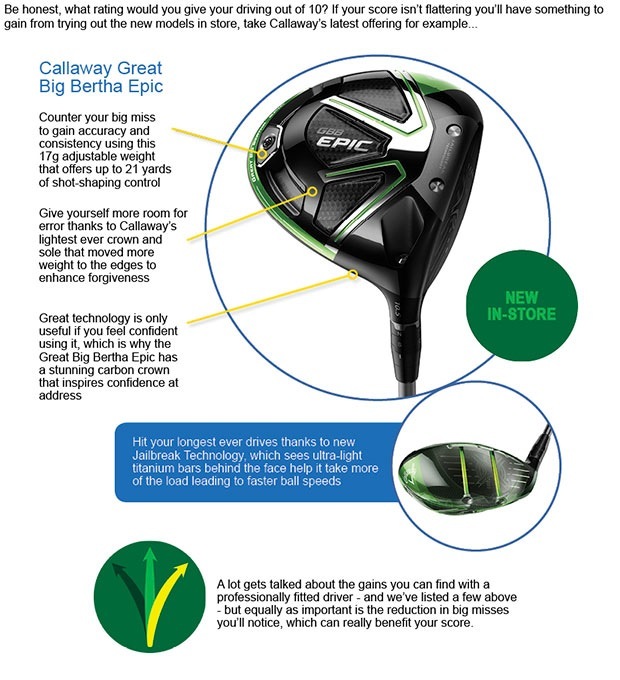 Many people are put off club fitting as they think they will be 'blinded by science' and not know what all the numbers mean but in reality you don't have to - we know what to look for and with all our years' experience in club fitting we will soon know what kind of club will suit you the most and help your game, all you need to do is book an appointment and turn up, we'll do the rest and we can virtually guarantee improved golf!! To enquire about a club fitting session contact us here. Please contact us here to book one of these fitting slots before they all go. Adam Powell's Junior Golf Academies continue to be popular and just since Christmas Adam has coached over 100 young golfers with many of them also playing in the regular on course competitions. Despite the wet weather on Saturday 12 juniors played in the latest Junior Winter League and the winner was Joel Cann with 17 points, the winner off the red tees was young Adam Glendinning with 14 points. Also coming up soon is Adam's latest junior day camp on Monday, 20 February - have a look at the poster for more details and on Thursday, 23 February and Friday, 24 February we will be holding our first Adam Powell Golf Academy Drive, Chip and Putt Championship which is sure to be a great couple of days for the kids and parents with fun competitions based on age ranges and FREE coaching slots on the day. For more details have a look at Adam's Facebook page here and give it a like to stay up to date.